HomeDivan Berlin–İstanbul at Heimathafen Neukölln on September 20 & 21! 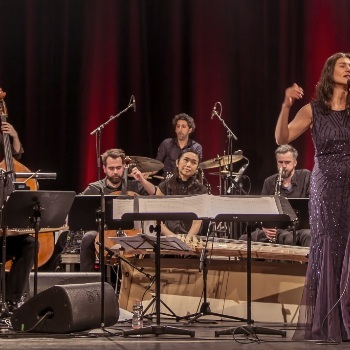 Divan Berlin–İstanbul experiments with contemporary music and poetry: Free sounds of kanun, saz, and kemenche meet trombone, electronics, and double bass – German verses encounter Turkish ones – they improvise, mimic each other, and transform into new sonic creatures. Music and poetry that approach the world differently, attempt to mutually apprehend it in this shared Divan. The background beat is the pulse of Berlin and İstanbul, two global cities of words and sounds, urban sources for artists, and places of creation under disparate working conditions. Outstanding poets and soloists open new galaxies between two metropolises. After its premiere in Berlin, the Divan will travel to İstanbul and will be performed on 07. December at 8PM at Bahçeşehir University (BAU). Divan Berlin–İstanbul is supported by the Capital Cultural Fund and the Goethe Institute. It is a production of Piranha Arts and Tarabya Cultural Academy. Media partners include Field Notes, renk.magazine and the House for Poetry. Further partners are the German embassy in Ankara and BAUART (a program of Bahçeşehir University).